The latest tool for expert witnesses who want to explain a crime or accident scene to a jury is the 3D laser scanner. A 3D scanner creates a three dimensional image of the area it scans. Used indoors, it can capture all the contents of a room, from floor to ceiling. Used outdoors, the scanner will record everything within a specified distance. Commonly used as a tool in industrial design and engineering, medical imaging, and the entertainment industry, lawyers and expert witnesses are beginning to appreciate the value of virtual reality as a litigation tool. As law enforcement agencies and experts make greater use of 3D laser scanners, 3D evidence will play an increasingly dynamic role in the courtroom. Photographs of accidents and crime scenes have value, but they rarely have the same impact on juries as a three dimensional representation. Virtual scans allow jurors to visualize the scene in more detail than two-dimensional photographs permit. Unlike photographs, a scan’s perspective can be changed to give the jury a ground level or “bird’s eye” view of the scene. A three dimensional representation even allows an expert to take a jury on an animated “fly through” of a crime or accident scene. Forensic experts also appreciate the wealth of data they can glean from 3D images. An accident reconstruction expert, for example, often works from measurements and photographs taken by accident investigators. Particularly when the investigators are untrained, the photographs and measurements may not give a reconstruction expert a complete set of data. A 3D scan, on the other hand, allows the expert to make precise measurements of distances between objects that are depicted within the scan. The clarity of 3D imaging also helps experts determine where an impact occurred by showing gouges in the pavement and other markings that might not be apparent from two-dimensional photographs. Fortunately, 3D scans are becoming available to experts when they analyze crime and accident scenes. More and more law enforcement agencies are investing in 3D laser scanners to document the scenes of serious accidents and crimes. That trend is likely to continue as 3D laser scanners become more affordable. In their book, The Crime Scene: A Visual Guide, Marilyn T. Miller and Peter Massey point out that evidence gathered by means of a 3D laser scanner has survived several Daubert challenges. The Daubert standard governs the admissibility of evidence in federal court and in most state courts. That 3D scan evidence is routinely admitted should not be surprising. In many cases, the evidence is not challenged. A 3D scan is essentially a virtual reality photograph. Just as courts admit photographs into evidence if a witness establishes that the photograph accurately represented the scene, a 3D scan should be admitted under the same standard. Assuming that the expert’s opinions pass the Daubert test, the use of a 3D scan to illustrate the expert’s reasoning is likely to be helpful to the jury, and should rarely be objectionable. Experts often use demonstrative evidence to help the jury understand their testimony. An orthopedic surgeon who points to the bones on a plastic skeleton while testifying is a classic example. If 3D scans are a modern version of traditional photographs, exhibits created by 3D printers are the modern form of demonstrative evidence. A plastic skeleton can be helpful, but an exact replica of a patient’s damaged knee joint gives juries a much better sense of a plaintiff’s injury. A 3D printer builds a model (in some cases, an exact duplicate) of an object from a digital file made with a 3D scanner. How closely the model will approximate the original depends upon the quality of the printer and the materials used to “print” the model. Typical models are made from thermoplastics, but more expensive printers can use ceramics and metals to build models that are virtually interchangeable with the copied object. Using 3D printers to build scale models of rooms, buildings, and crashed vehicles generally results in a more accurate model than one that is constructed by hand. In addition, manufacturing an elaborate model with a 3D printer is usually quicker than making traditional models. 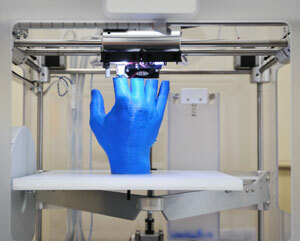 Only the expert’s imagination limits the potential uses that can be made of 3D scanners and printers. As the devices become more affordable, lawyers and experts alike should keep their benefits in mind when they think about how to present expert evidence to a jury.